Over the years, I’d estimate that I’ve sunk well over a thousand hours into various MLB The Show games across the various PlayStation platforms on which it has appeared. Last year, thanks to Sony’s personalized “Year in Review” email, I know for a fact that my top two games played in 2017 were MLB The Show 15 (because Vita means life) and MLB The Show 17. I really, really like the franchise, is what I’m trying to say, and I like to think I’ve developed a sense for telling when a year’s iteration is a leap forward, versus when it’s just the franchise treading water. And I’m sorry to report that MLB The Show 18 is more treading water than leaping forward. In fact, if I’m being really honest, it seems more like a small step backward in some respects than anything else. Don’t get me wrong: it’s still a solid baseball experience. I haven’t yet had a chance to sink my teeth into this year’s RBI Baseball, but if past years are anything to go by, I’m willing to bet that The Show is still the version to check out if you want to play baseball on current-gen consoles. Between Road to the Show, Diamond Dynasty, and Franchise mode, there’s still lots and lots to do here. Online works pretty well, which isn’t something that could always be said in the past. Everywhere you look, it seems like tweaks to MLB The Show 18 actually made it worse. Take Road to the Show, which is the entire reason why I’ve put in so many hours with this franchise. Last year’s RPG-like progression system is still here, which is…what it is, really. Given that FIFA, both NBA franchises and Madden have all put a lot of effort into turning career modes into something more cinematic, MLB The Show’s steadfast insistence on keeping things simple and player-driven is either stubborn or welcome, depending on your point of view. That said, the way created players progress this time out seems much more impersonal. Whereas before you earned points for various actions and chose which skills you wanted to spend those points on improving, in MLB The Show 18 the game progresses your player’s skills for you. On top of that, before you even start your career, you have to decide which type of player you want to be. While this may be more realistic, it also feels incredibly limiting. Like, if I wanted to create a shortstop who hits over .400 at the same time as he’s breaking the single-season home run record, all while playing Gold Glove-worthy defense and stealing bases at a rate that would make Tim Raines envious, I don’t see why the game should actively stop me from doing so. Which leads me to another issue I have with MLB The Show 18: all the existing players seem to have had their abilities capped as well. Again, on the one hand, I guess this is fair, seeing as the game gives you the option of having legends like Babe Ruth, Jackie Robinson, and Mike Schmidt participate in both Diamond Dynasty and Franchise mode. While stars like Francisco Lindor and Carlos Correa may be great right now, I suppose that if you compare them to every shortstop who’s ever played the game, they probably get knocked down a few points. At the same time, though, it’s weird seeing most undeniably modern-day superstars have their ratings in the mid- to high-80s. It also means that building teams is a bit of a challenge, because with the adjusted ratings the difference between a great player, a good player, and an average player is incredibly small. Again, it may be realistic, but it doesn’t feel like the extra bit of realism adds much to the game. Ironically, though, one of my biggest complaints about the game is arguably in an area where it strays furthest from realism: the way the balls come off the bats. Time and again in MLB The Show 18, in every mode, I’d hit what seemed like a rocket off the bat, only to discover that it was actually a lazy fly ball. I’d chalk it up to my own ineptitude if it weren’t for the fact that this even happened when I was playing single games against the AI with the hitting and pitching sliders changed to allow for maximum offense. Given that, in real life, home runs are flying out of the yard at historically unprecedented levels, it’s kind of weird that the developers would opt to deaden the ball here. At this point, given the volume and number of my complaints, you’d be forgiven for thinking I hated MLB The Show 18. That couldn’t be further from the truth. It’s far from perfect, but, as I said earlier, it offers a solid baseball experience that can’t be found anywhere else. There are all kinds of ways in which the game could be improved, but, at this point, those improvements would mostly constitute minor tweaks here and there — it’s not like Sony went all NBA 2K and broke their flagship sports franchise or anything. I’d be lying if I said I enjoyed MLB The Show 18 as much as some of versions from previous years, but it’s still a decent enough game that doesn’t fall too far below the standard people have come to expect from the franchise. 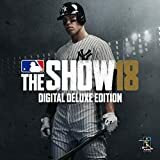 Sony Interactive Entertainment provided us with an MLB The SHow 18 PS4 code for review purposes.